In Massachusetts employers may pay a lower minimum wage to certain workers who regularly earn tips (when their tips bring them up to the minimum). Originally set as a percentage of the regular minimum wage, the tipped minimum wage, as it is called, was frozen at $2.63 per hour in 1999 and has not been increased for the last 14 years. Since 1968, the real value of the tipped minimum wage has fallen 58 percent, even further than the regular minimum wage. The decline in value particularly affects women, who constitute a disproportionate share of tipped workers. In seven states employers are required to pay tipped workers the same minimum wage as everyone else. 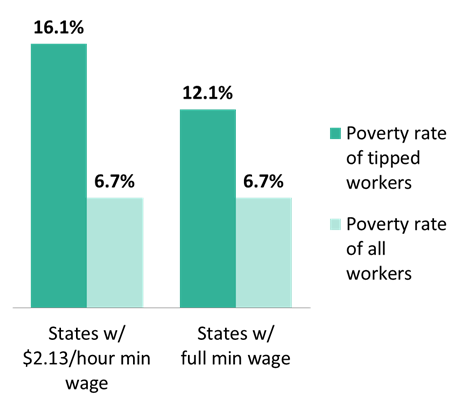 In those states, poverty is substantially lower among tipped workers. The chart below compares poverty rates in states with the lowest tipped minimum wage (the federal minimum of $2.13) to those states where tipped workers are required to be paid the full minimum wage by their employer. There are also a number of states in between. In those the average poverty rate is also in between. As the chart below shows, it is not that the states with low tipped minimum wages are high poverty states generallyit is specifically tipped workers who are more likely to live in poverty in states with low tipped minimum wages. 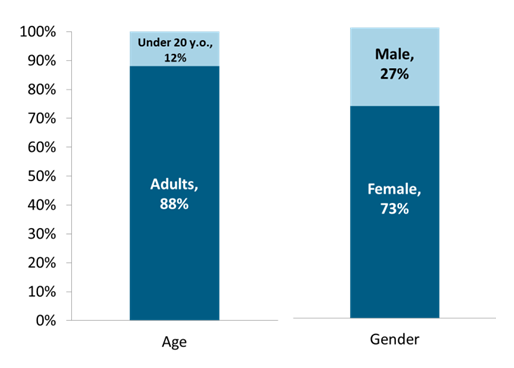 Eighty eight percent of tipped workers are adults and 73 percent of tipped workers are women. Thus it is adult working women whose ability to support themselves and their families is most affected by the tipped minimum wage rate. Some of these are very low wage workers struggling to escape poverty. Others are making $20,000 or $30,000 a year or more. Policies that raise the wages of these low and moderate income working women will help them to be able to support themselves and their families. Source note: Data from the Economic Policy Institute's Waiting for Change and MassBudget's The Declining Value of the Tipped Minimum Wage in MA.